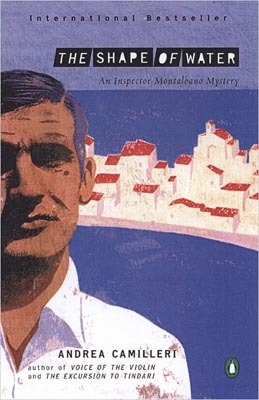 Andrea Camilleri’s Inspector Montalbano series consists of nineteen novels and four short story collections – fourteen of which have been translated into English. There was an Italian TV series that ran for 1999 to 2008. All in all, it looks to have been hugely successful. But as experience and the Twilight series have taught us – success does not always equal quality. Fortunately for Camilleri, and for us, here the two go hand-in-hand. The Shape of Water is a skillfully written, fast-paced police procedural. The author keeps the action moving and the reader’s interest by cutting from scene to scene with the use of dark slashes (similar to the ones on the cover). One moment Montalbano is scouring the newspaper for information, the next he’s on the phone. Two pages later we are with him re-examining the crime scene. The slashes act a lot like the famous gong on Law & Order. In fact I wouldn’t be surprised to learn that Camilleri was a fan of the show. The Shape of Water, the first book of the series, introduces Inspector Salvo Montalbano. He is handsome, a “real man”, in love with & faithful to his girlfriend Livia (which he has ample opportunities to prove – women proposition him at a rate that would make Mikail Blomkvist look celibate). Montalbano lives and works on the island of Sicily. He is well-known, good at his job, seemingly liked and respected by everyone – an all-around great guy. It would be difficult not to find him a compelling. He is the perfect Italian hero, down to the mole on his cheek. If I were a good reviewer I would, at this point, go into the plot. But why bother? Just trust me when I tell you that it’s a good mystery. There are twists, turns, political scandals, great dialogue, charismatic informers, beautiful women and evil men… none of those things are why you should read this book or why I’ll continue onto the next book in the series. Then what’s the draw, you ask? Well I can’t speak for the Italians. For those of us in the United States the reasons are obvious: the Mediterranean landscape, the sun, the sea… mostly, though, the FOOD. Andrea Camilleri’s novel leaves the reader feeling as if they’ve won a free vacation to the island of Sicily. The best kind of vacation – the kind where you aren’t a tourist. The kind that drops you into an Italian movie where, at any moment, a young Sophia Loren pulls up in front of a fountain in a little red Fiat. That’s probably not the reality – and Camilleri intelligently crafts a plot that gives you a hefty dose of gritty reality (or at least what passes for gritty reality, which amounts to the same thing). He’s also smart enough to throw in some fantasy, too, allowing the setting to play a starring role. This first Inspector Montalbano mystery is Modern Meditteranean Crime Noir. I don’t know if that’s an actual genre…but if it isn’t, it should be. Note: The edition I read was published by Viking, c. 2002. Current editions are (I believe) published under the Penguin Paperback imprint (information & link below). Publisher: Penguin Books, New York (2005).